fI had just wrapped up my 5-day stay in the least visited country in the world, Nauru, which as you may recall, was very memorable yet, at the same time, getting very boring by the end. So how would I find the next Pacific Island stops. Would I embark upon exciting new adventures in a rarely visited part of the world? Would I grow tired of being stuck on remote islands? Or, would I stumble upon another refugee gulag or someone like Bounty mutineer descendant Steve Christian? Also, storm clouds were more than just gathering They were drenching the Central Pacific. Would this put a mere damper on the next phase of the island hopping journey or was it a more ominous sign of things to come? I should mention that what I have yet to explain to you was that my Pacific Island hopping in late 2018 and early 2019 was part of an organized tour. The “Least Visited Countries” tour is actually organized by the same company that I traveled with to North Korea (visiting the rural northeast, beautiful Mt. Chilbo and, of course, Pyongyang). In the Pacific, in addition having seen Nauru, I had also on my own visited Guam and taken the famous United Flight 155 Island Hopper to the Marshall Islands. It’s Kiribati, not Kiribas… or is it?? Now that you’re all caught up with this island hopping journey, let’s get started with Kiribati, which I must warn you is not pronounced as it appears. Kiribati is actually pronounced “Kiribas.” In Kiribati’s Gilbertese language, the “ti” makes an “s” sound. With that housekeeping item addressed, we can really get started with Kiribati. This island nation of about 100,000 people is uniquely situated in all four hemispheres. That’s right. Kiribati is located in the Northern Hemisphere, The Southern Hemisphere, The Eastern Hemisphere and The Western Hemisphere. It straddles both the equator and the 180th meridian. Things get a little confusing with the international dateline, which swings around Kiribati, diverging from the 180th Meridian. The curvature of the dateline makes Kiribati’s Southern Line Islands — the easternmost part of the country — the first places in the world to experience a new day and a new year. The Southern Line Islands, which include Kiribati’s Christmas Island, lie south of Hawaii, yet they are a full day ahead of the Hawaiian Islands. This part of Kiribati has the world’s farthest forward time (UTC +14). Upon landing in Tarawa, Kiribati’s capital and main atoll, it was pouring rain and we got soaked while just exiting the plane and getting across the small airport. We went through immigration, where the officers were very surprised to see foreigners. There are some foreigners in Kiribati, but it is one of the five least visited countries in the world. Kiribati has basic hotels, not beach resorts. We stayed in what was essentially a motel. Tarawa, which lies northeast of Nauru and southeast of the Solomon Islands, has a population of about 50,000, or about half of Kiribati’s inhabitants. My tour group only visited The Tarawa Atoll, which isn’t lacking sights to see due to its World War II history. Tarawa was the site of a famous World War II battle. You guessed it… it was called the Battle of Tarawa. Fought on and around Betio Island in the Tarawa Atoll in 1943, the Battle of Tarawa was one of the bloodiest battles in World War II, with about 6,500 casualties over about a 76-hour span. The Battle of Tarawa was the first American offensive in the Central Pacific. At that point, the Japanese had been forced out of Alaska’s Aleutian Islands in the North Pacific and the Solomon Islands in the South Pacific were on the verge of capture. But the Japanese still held onto the Gilbert Islands, now part of Kiribati, which they seized in late 1941. Prior to storming the beaches of Betio, the Americans drew up a plan known as Operation Galvanic, which aimed to capture the Gilbert Islands. When the Americans attacked Betio, the Japanese were well prepared and heavily armed. The Japanese fought until the very end. Nearly 4,700 Japanese soldiers died in the Battle of Tarawa, while nearly 1,700 American soldiers died. The battle has been dubbed “the toughest battle in Marine Corps history.” The victory in Tarawa gave the Americans the edge in the Pacific Theater. Betio is its own island on the atoll. 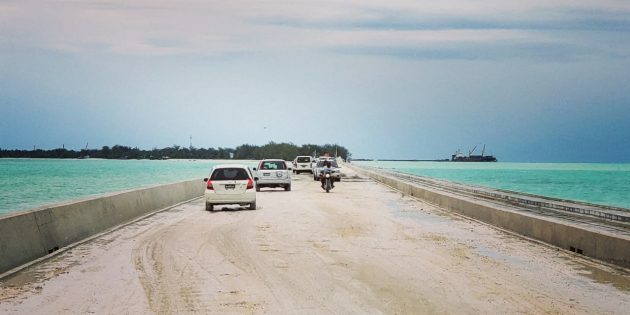 To reach it by car, you need to drive over a causeway that connects Betio to the rest of South Tarawa. Yes, as you can see from photos, it is a very scenic area with views of Tarawa’s light blue lagoon. But the road is another story. It might be the worst road in the entire world. The road has so many potholes. It took us 20 minutes to go 1 km. It would have been faster to just walk across the causeway. Betio is actually the main island of the atoll, even though it is located on the atoll’s southwest corner. Most of the population and buildings are on Betio. The island is littered with remains from World War II. All over the place you can find guns, bunkers and even sunken ships. The local kids use the World War II relics as playgrounds, running around them and climbing on top of them. But the history is fascinating. I stopped at a bunch of signs to read about the historical landmarks. We also visited a Battle of Tarawa memorial. While my stay in Kiribati as a whole wasn’t that memorable, I really treasured this opportunity to learn about a pivotal Pacific World War II battle. Other than that, we went all over Betio, checking out some beaches and eating lunch at a local restaurant, which of course, was another Chinese place. Also, we visited a local sports center that happens to to have been financed by Thailand. The rest of my stay in Kiribati was quite uneventful. On the second day, it rained throughout the day. The group did some boring things on the other side of the island, and I chose not to join them. Rather, I stayed at the hotel and tried to get some work done while making use of the very slow internet. I did, though, take part in a tour of a copra factory. What’s copra? Copra is something that comes from a coconut. It’s the dried meat or kernel of the coconut. Coconut oil is extracted to produce copra cake, or copra meal. The cake or meal is mostly used for animal feed in the agricultural industry. Like many Pacific nations, Kiribati is an exporter of copra meal. We got to see how it is produced. Upon departing Betio, we got stuck. What happened was we were driving back across the causeway (that beautiful drive with an awful road), and a stone got wedged inside one of our tires. The driver had to get out of the vehicle and get the stone out of the tire. That took about 20 minutes — again we could have walked to the other island faster than driving. But on this occasion, I got to pass the time by watching pigs get transported in the back of a truck. What is so funny about seeing a pig — with humans — in the back of a truck? Who knows? 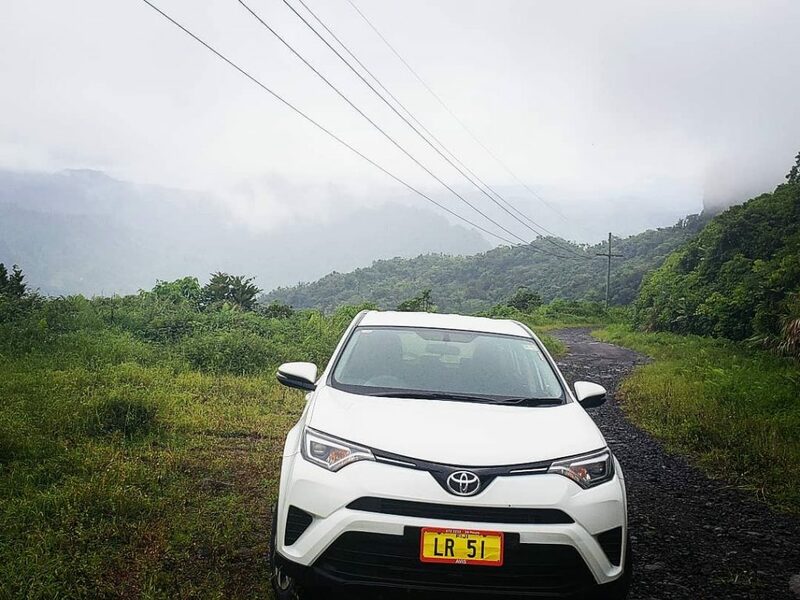 But when you’re stuck on one of the world’s worst roads and you grow tired of looking at the beautiful blue lagoon, that’s the kind of entertainment that excites you. All in all, Kiribati’s people are very friendly and welcoming, and the kids love to have their photos taken with foreigners. So the Tarawa Atoll can make for some fun, in addition to a worthwhile World War II history lesson. Why is everyone spitting blood in the Solomon Islands?! The truth is they are not. But want a scary picture of what is going on? Type “betel nut mouth” into Google images. Well unfortunately, that’s what a lot of people look like in the Solomon Islands, which is actually a pretty nice country, by the way. We will get to that in a bit. Betel nut is really the Areca nut, since it is the fruit of the Areca tree that grows in tropical areas in the Pacific. But most people refer to the nut as betel nut because it is found wrapped in betel leaves, ready for consumption, particularly in Southeast Asia. And in the Solomon Islands and its capital, Honiara, consumption of betel nut is very widespread. People go around chewing betel nut and then spitting on the ground. Betel nut consumption makes your saliva red, so it looks like people are spitting out blood, but they’re not. Still, betel nut poses a major cancer risk, and it is clearly addictive. Pretty much everyone chews it in Honiara, even little boys. I’ve never tried betel nut. Some people say the effects of consuming it are similar to drinking alcohol. But betel nut consumption does not come with a hangover and other side effects of drinking booze. Solomon Islands or Islas Salomon? The Solomon Islands are an interesting country in more ways than it being a big drug state (by my designation). Located east of Papua New Guinea, the Solomon Islands were discovered by Europeans — after being inhabited by other people for thousands of years — in 1568. That was when the Spanish arrived. Spanish explorer Alvaro de Mendana named the islands Islas Salomon after King Solomon from the bible. The islands have retained that name, though in its English form. Individual islands have retained their Spanish names. For instance, the country’s main island, where Honiara is located, is called Guadalcanal. As with Tarawa in Kiribati, Guadalcanal in the Solomon Islands was the site of a major World War II battle. We will get to that, as well. Formerly a British protectorate, the Solomon Islands are now a constitutional monarchy headed by Her Majesty Queen Elizabeth II. The Solomon Islands have a parliamentary government, and we visited the parliament in Honiara. We arrived in Honiara and checked into the very nice Heritage Park Hotel. By chance, maybe, this was the hotel that Prince William and Kate stayed in during their 2012 visit to the Solomon Islands as part of a tour of the Pacific celebrating the queen’s diamond jubilee. The royal couple announced that Kate was pregnant a few months after theirs stay in Honiara, prompting people to call their room at the Heritage Park the “conception suite.” It so happened there was a fertility statue inside the royal couple’s room. The hotel had a nice restaurant. We got to enjoy watching local girls dancing for us. We also got to meet the hotel owner. The Solomon Islands were already becoming a nice change of pace. The highlight of my time in the Solomon Islands was definitely our visit to the Kinugawa Maru, a Japanese transport ship that wrecked during World War II. During the Guadalcanal Campaign, an important series of battles in the Pacific prior to the Battle of Tarawa, the Kinugawa Maru was making supply runs known as the “Tokyo Express.” In November 1942, the Japanese beached the ship at Guadalcanal Island when it came under American gunfire. The wrecked transporter remained in a partially sunk state for a couple of decades prior to being partially salvaged. Now the ship is a popular dive site. The wreck lies about 20 meters away from the beach, but it’s actually a large sunken ship and the drop-off is sudden. The area is amazing for snorkeling. I hopped in the water with my snorkeling mask and checked out the wreck. In addition to the wrecked ship, there were impressive fish in the area. Speaking of which, I should mention that before getting in the water I was worried because the Solomon Islands have a large population of saltwater crocodiles. Remember when I swam with one of those beasts in Australia? Well this time I didn’t have a cage to protect me, so I was concerned. But our guide assured me, saying the crocodile attacks had occurred in a different region. It turned out I had one of the best snorkeling experiences of my life. The only disappointment was that I didn’t have my GoPro. Solomon Islands — worth a return visit? We only had one full day in Honiara and the whole country for that matter. So there wasn’t that much time, and we didn’t do too much more. 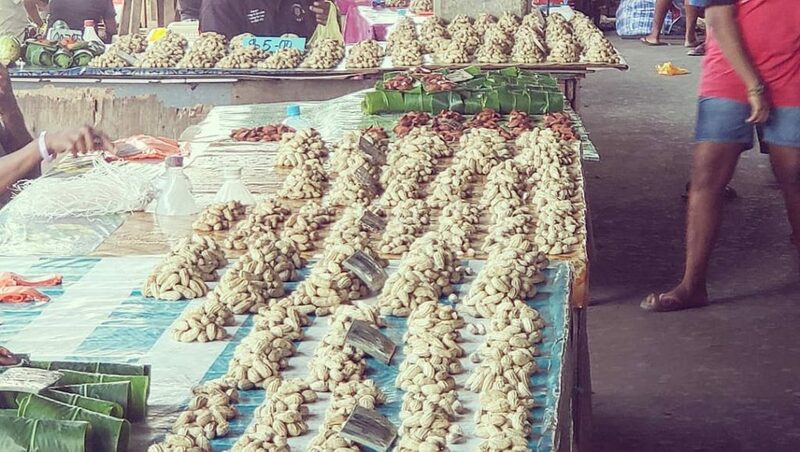 We explored the central market of Honiara, which of course afforded us the opportunity to get a look at some betel nut displays. The market is apparently notorious for pickpockets. I was clutching my pone tightly. Nothing happened. Other than that, we also went to some lookout points that offered good views of WWII battle sites and Guadalcanal’s terrain. In general, I was very happy to see some green and some mountains, which the Solomon Islands have plenty of. Having visited so many islands around the world, I like an island that has more to offer than just sand and palm trees. So… I’ll come back another time and explore some other islands in the Islas Salomon. In Honiara, we boarded an Air Niugini flight and flew to Vanuatu, a volcanic archipelago and island nation southeast of the Solomon Islands. Vanuatu was the most exciting part of the Pacific island hopping adventure. That means you will have to wait until the next blog post to hear about it. But in the meanwhile, you get to hear about Air Niugini. In Nadi, we stayed not in a fancy hotel, but in a hostel. We had our own private rooms, but it was incredibly hot at night and I couldn’t sleep. Rather than sleeping, I spent most of the night standing out on the street doing consulting calls. The next day I joined the group for a tour, or at least part of it. The main attraction was a Hindu temple. You may not have known that Fiji has a large Indian population. More than a third of the country’s population is of full or partial Indian descent. Indians were originally brought to Fiji as indentured servants from low-caste tribes during British colonial times around the end of the 19th Century and beginning of the 20th Century. They comprise a large portion of the population in Nadi, where there is an interesting mix of Hinduism and Islam due to Indian immigration. 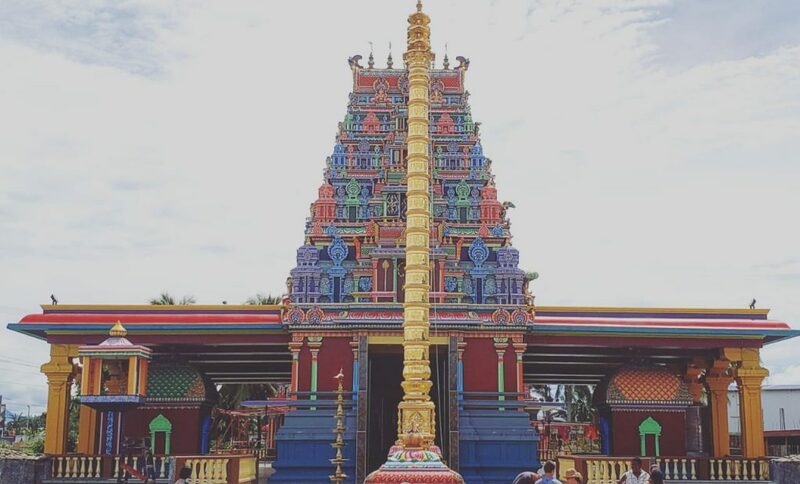 The Hindu temple in Nadi, Sri Sivasubramaniya Swami, is actually the largest Hindu temple in the Southern Hemisphere. It is a cool sight to see. And we were fortunate to get in. We showed up mostly dressed in shorts and skirts. We were given some sheets to cover our legs and feet and then were allowed in. We also visited some manufacturing place, as well as the Garden of the Sleeping Giant, which is basically a big collection of orchids and other vegetation that belonged to the American actor Raymond Burr. Despite having this abundance of beautiful nature, I actually spent most of the day in my hot room trying to get more work done. I was off to a busy start to 2019. A productive one too, despite the elements. In the evening we went to a Korean place and had a big barbecue. The backstory to this is that, as I previously mentioned, this Least Visited Countries tour was being put on by the company that I traveled with to North Korea. 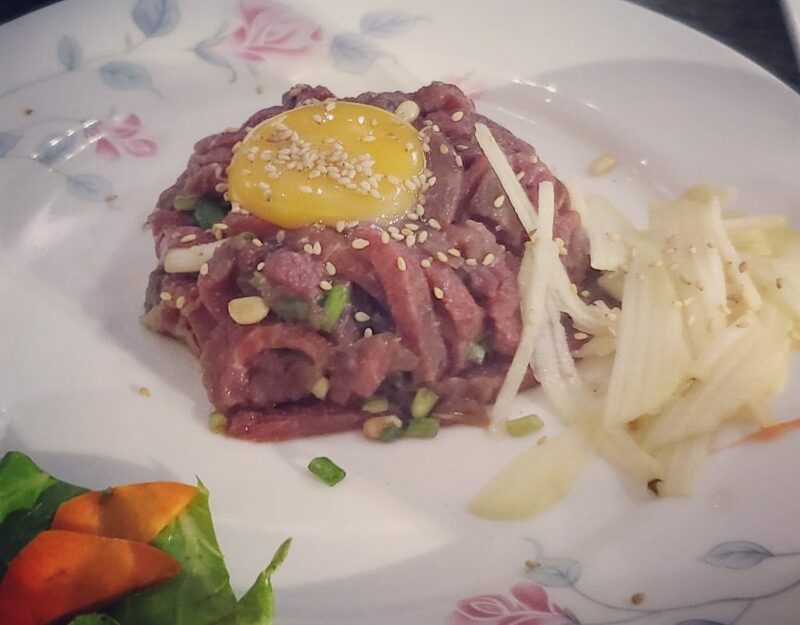 Their specialty still is North Korea, and one of the founders of the company has spent a lot of time in the DPRK and can speak fluent Korean. My Fiji adventure was certainly not complete. But it was time to move on to Tuvalu for a brief stay on the last little island nation of the journey. First, we boarded a short domestic flight from Nadi to Suva, the capital of Fiji. Suva is located on the opposite side of the main island. 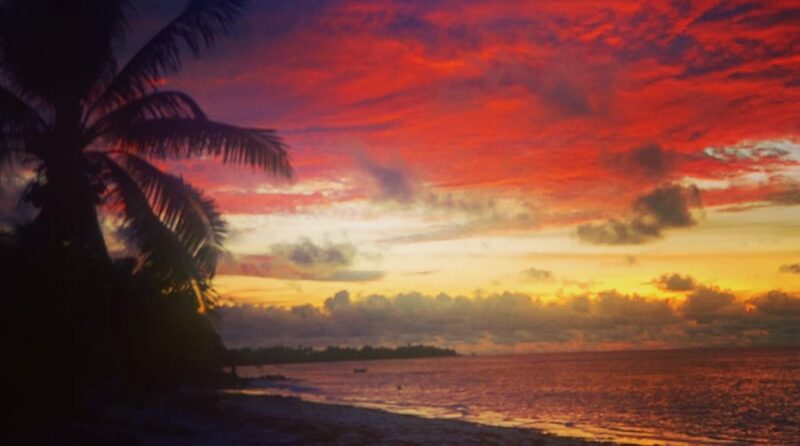 I would be returning there after this trip to Tuvalu. Our flight from Suva landed at a small airport in Funafuti, the capital of Tuvalu. Funafuti International Airport and the surrounding area give you a good feel for the country as a whole. Even though this is the country’s only airport, it has just three flights a week — two to Fiji and one to Kiribati. When it’s not time for a flight to land or take off, the airport is used as a boys’ soccer field. 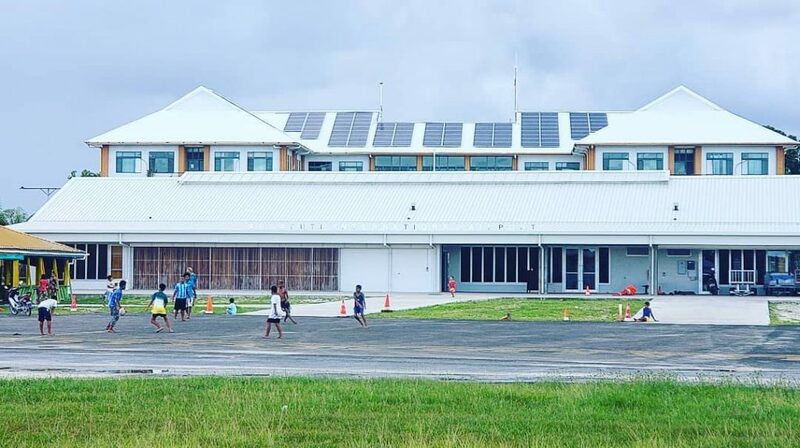 Tuvalu’s parliament is located right next to the airport and you can see it from the runway. The parliament has solar panels on its roof, which are paid for by Taiwan. During our stay we actually met the ambassador of Taiwan. He is basically the only ambassador on the island. Again, it’s kind of like Nauru. In this area where the airport and parliament are located also stand the government building and the national bank. Many Tuvaluans work abroad or at sea and send money back. The national bank apparently is responsible for dispersing the remittances. Oh, and there was another building in this same location. That was our hotel. Tuvalu is a very small country. By population it is the second smallest in the world, trailing only the Vatican. Tuvalu has a population of a little more than 10,000. By land mass, it is the fourth smallest country, as it is slightly larger than Nauru. Tuvalu is basically a long atoll plus some smaller islands and atolls. There are a total of 9 islands in the country. What little action there is, happens on the main island, which in some places is remarkably small, or maybe I should say thin. From above, the country just looks like a thin strip of land. Would you like to live in a country like this? Actually, this a beautiful walk. On one side of the island there is the ocean. And 20 meters away on the other side of the island is a big lagoon. If the climate change scare of sea level rise comes true, Tuvalu is at risk of being wiped out. Flooding is already a problem. There was big storm while we were there. Some parts of the island were underwater. We had 3 days and 3 nights in Tuvalu. Why? I think you already know why. There are only two flights a week back to Fiji. Over the three days, we explored the island and Funafuti. Tuvalu does not have that much in the way of World War II history. The airport is basically the only relic. It was built by the U.S. Navy during the war and was used for carrying out air raids on Japanese positions on other islands in the Pacific. While going around the main island, we checked out some of Tuvalu’s beautiful beaches, met some locals and did some dining. We ate at the only restaurant on the island. Actually our hotel had a small restaurant, too. But this was the only formal restaurant on the island. Of course it was just a Taiwanese/Chinese place. But better yet, on one occasion, we were invited into the home of a Tuvaluan woman who used to live in New Zealand. She cooked a Tuvaluan speciality for us. The dish was chicken with some kind of herbs that are only grown on the outer islands of Tuvalu. It was yummy. The stay in Tuvalu also included a day trip to one of the small islands on the other side of the lagoon. This was kind of like my Marshall Islands day trip. I got to spend a day on the beach at a tiny island and go snorkeling. But the reefs weren’t nearly as nice as the ones next to the beach in the Marshall Islands. During this Tuvalu day trip I managed to circle the island twice while snorkeling. It only took me like 20 minutes to complete a lap around the island. Our little boat that transported us back and forth didn’t manage to keep us dry, but it was a fun ride at sea nonetheless. Our Tuvalu stay ended with a beach barbecue. This festivity was actually an open-air disco with lights and music. There were also locals at the beach who were playing games. The whole scene was kind of funny. 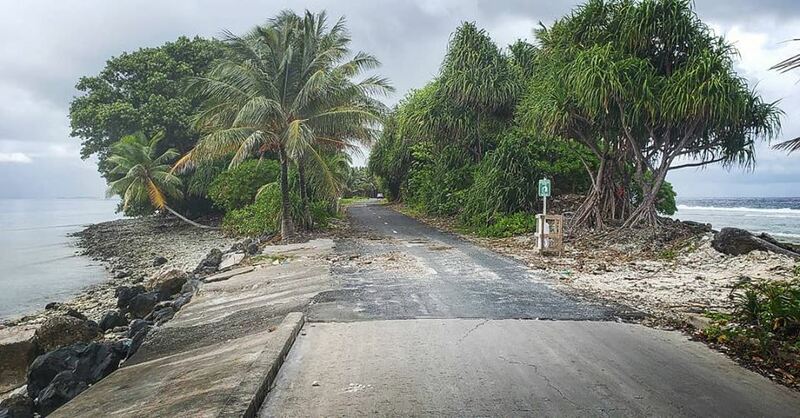 Tuvalu, as you can see, is very undeveloped. Still, it was quite nice to be there. It’s like a little slice of paradise far away from the troubles of the modern world. Having flown back to Suva, all that was left in my Pacific adventure was one drive. It was my final day in the region, and I had already parted ways with the group. I had a flight to Los Angeles (this time, for a mini California road trip) to catch in the evening. I was flying to LA from Nadi. Suva and Nadi are on opposite sides of this surprisingly large island. I was set upon taking a road trip. But would I have enough time? I chose to go through the interior of the country. I looked at the map and thought there must be a nice road going all throughout Viti Levu (remember, that’s the name of the island). At first the road was paved, and things were going well. But then the road turned to gravel. I continued for an hour, but then I started getting lost. I was driving on parts of land where Google Maps said there is no street at all. Starting to get panicked, I backtracked and took a closer look at the map. What I discovered was that the road I was on basically ended at a river, and there was another road on the other side of the river. But there was no bridge or ferry. I had to go back. That took about an hour. With limited time but still several hours remaining before I needed to be in Nadi, I was left with the choice of taking a coastal road or an inland road that I didn’t consider before. The reason I hadn’t considered it was that it was a gravel road — basically from start to finish. But I really wanted to see the interior of Viti Levu. So I embarked on a fresh adventure. Along the way to Nadi, I passed many mountains, including the tallest mountain of Fiji. I also passed Fiji’s fresh water reservoir, as well as some small villages where people were surprised to see me. At some point, when I was in the middle of nowhere, one of my wheels broke. I still managed to press on. Toward the end of my drive, I was back on paved streets. I drove through the city of Lautoka, which is north of Nadi, and had lunch there. I wandered a bit through the city before continuing to the Nadi airport. Eventually, I made it, but I really underestimated the distance from Suva to Nadi. I thought the drive would only take me about 2 hours. It took 6 hours. Interestingly, over those 6 hours, I only passed 5 cars heading in the opposite direction. Away from civilization, I got a great look at the interior of Fiji, which is covered with green mountains. It was basically a day of driving and taking photos. Except for the weather, which somewhat obstructed my view of Fiji’s landscape, I couldn’t have asked for a better conclusion to my multi-week Pacific island hopping adventure. Can I see myself living on one of these islands? Ok, fine… I’ll elaborate a bit. I couldn’t imagine making a home on one of these tiny island nations, even if they are tax oases, which is appealing. For foreigners, settling on one of the remote, rarely visited Pacific island nations is really just for someone who wants to get away from it all. Nonetheless, it’s fun to visit these places. Just be prepared to eat a lot of Chinese food.